Whether you just got a brand new laptop or you've had an old notebook for several years, it's in your best interest to maximize your laptop battery life so you get the most out of your computer. Practicing these habits and others (illustrated below) on a regular basis will give the battery in your laptop a long and prosperous life. Got other tips for extending your laptop's battery life? Share with us in the comments below. 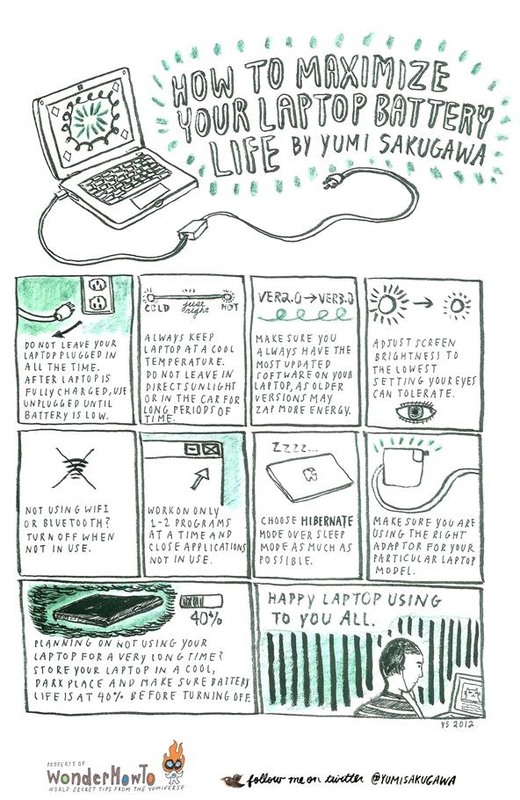 Unplug your laptop until your battery is empty?? What a #$%@ty advice! Your battery loose capacity every cycle! She didn't mention unplugging it until it's "empty". Just until it's low. And though this could help lower its life by unintentional cycling, it could help when dealing with things like overheating (which is mentioned directly after). It really depends on a lot of factors, like what kind of battery you have and how well your computer is performing and setup. As for manufacturers, each one says something different about keeping a computer plugged in. Dell states your battery will be fine leaving it plugged in all of the time. Apple suggests not leaving it plugged in constantly, but to occasionally run it down to keep the juices flowing, and to discharge the battery completely at least once a month. HP says you should remove the battery completely if you're running on AC for weeks at a time, but they do not expand upon that. I keep my laptop plugged in all of the time. It's really one of the only things I don't think about in terms of lifespan. I just hope it works out. But I do (try to) pay attention to everything else! Thank you for such a thorough explanation Justin! These 9 tips are the right one I need for our Toshiba laptop batteries as they need longer last time when users are using them at night. empty, low ? whats the difference. Leaving plugged in while you are using it is the best way to keep the battery at the maximum of its life. I can't help but have mixed feelings on that. I leave my laptop plugged in at work and never plugged in elsewhere, and my battery has lasted me 2+ years so far, and seems in good health still. My friend, who has the same computer, is on her 3rd battery in the same time-span, and she leaves her computer plugged in pretty much all of the time, no matter what. One of her batteries even expanded and popped out of her computer, likely due to overheating. Like I said, me personally... it's one of the least things I worry about when concerning battery life. There is a HUGE difference! Empty means the computer is practically dead. Low is a matter of personal opinion, but IMO it ranges from 1% battery life to maybe 25%. If you are going to leave it plugged in all the time, what is the point of getting a laptop? As Justin said above, batteries can overheat and go through unnecessary cycles. For example in the new iPad, it is in its design to release some power while charging so that it can be "left plugged in indefinitely." However, that fundamentally will run down the lifespan considering that it has to discharge and recharge while it isn't even doing anything. Lithium ion batteries should be stored at 80% and if you want to take care of your battery while plugged in, just slide it out. I bought a old acer's lap to my bad luck it's battery doesn't have the capacity to run one hour, if I use internet it won't run half an hour. What should I do now. what if your laptop has a non-removable battery and you use it as a desktop. I have been using Dell Inspiron 5520 since 5 years now, while I have always plugged in for most of the times, the battery is working just fine, I could only observe 20% to 30% deterioration. Logically the charge by passes battery circuit when the battery is fully charged and plugged in, that is the reason it does not conk off when you actually slip the battery off while it is plugged in, I ensure that battery is drained off completely once a month this keeps the battery calibration intact. Do let me know if this helps.